Taking time out to admire Brutalism and enjoy some street food in London. With a week off work I decided to use my time off wisely by spending a couple of days in London with my wife. I'd been invited to try some Street Food and was keen to visit some of my favourite Brutalist buildings again, so this was the perfect opportunity. With the Norwich to London train line being an engineering work nightmare at weekends it also made much more sense to travel direct on weekdays. 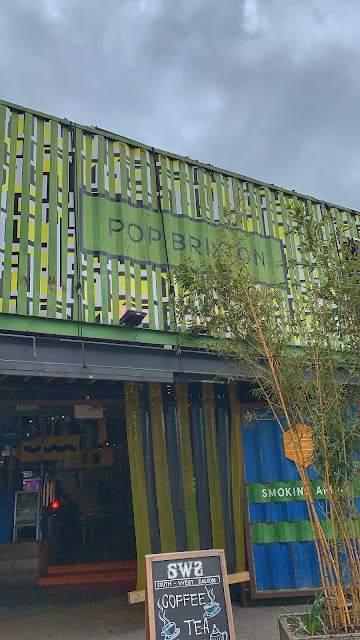 First stop Pop Brixton, a few minutes walk away from Brixton tube station. This was my first visit here and even from the outside I was impressed by this colourful space built using shipping containers. I'd visited Boxpark in Shoreditch before but Pop Brixton seemed to have heaps more character. 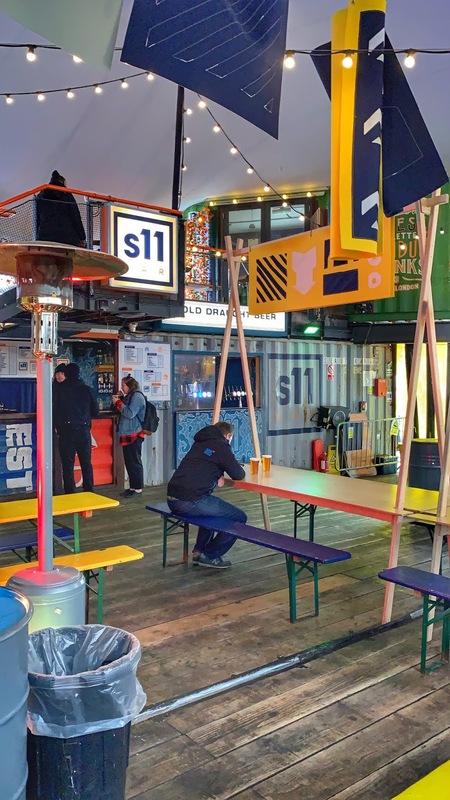 Inside it's home to street food stalls, bars and even a restaurant. There's open space in the centre to eat and drink and if you make your way to the top floor there's also a large greenhouse dining area lined. 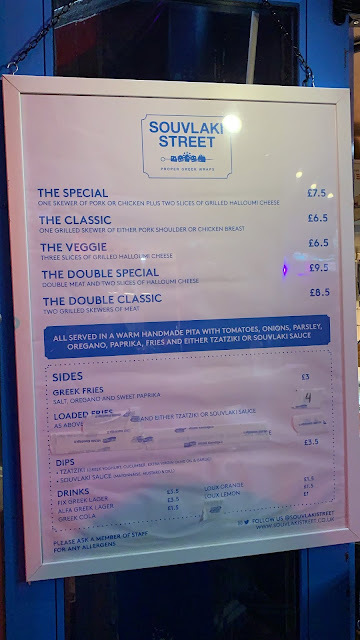 Souvlaki Street was the main reason we'd come here, to try a proper Greek Souvlaki. 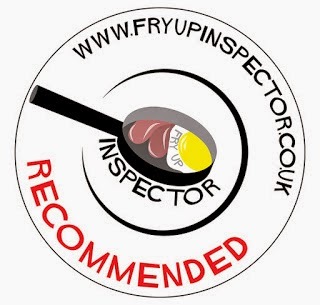 When we arrived the staff were having a few issues with their new fryer meaning they were unable to fry chips, an important part of a traditional Soulvaki we were told. This didn't deter us though as we were still keen to try this popular Greek street food, with or without the chips. Whilst waiting for the food we chatted with the staff over a Greek beer. 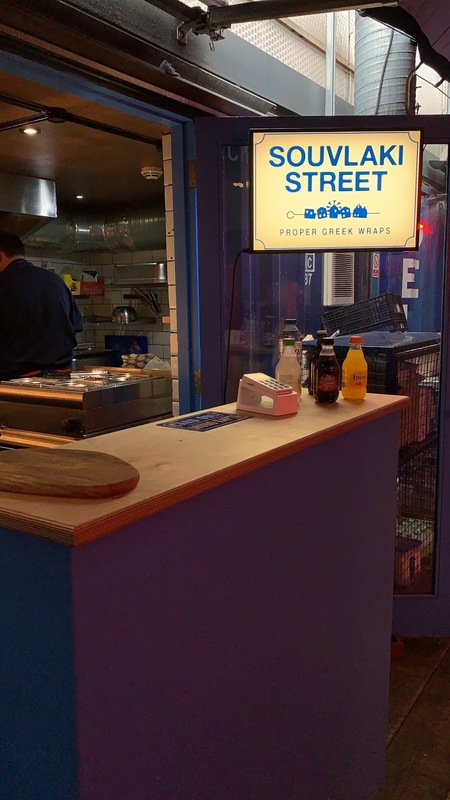 Soulvaki Street had originally been selling at street food markets from 2014 across London, Pop Brixton was their first permanent home though. When the food was ready we headed upstairs to the greenhouse terrace to eat. Why give flowers when you can give a Soulvaki! These tasted so good, even without the chips that are usually found inside too. The warm homemade pitta was wrapped around a delicious combination of pork, halloumi, tomatoes, onions, parsley, oregano, paprika and tzatziki. Everything was so fresh and full of flavour, my first Soulvaki experience definitely left me wanting to try this again in the future. If you get the chance be sure to look up Soulvaki Street next time you're in Brixton. With Parliament Square protests taking place we were only able to catch a bus as far as Lambeth. 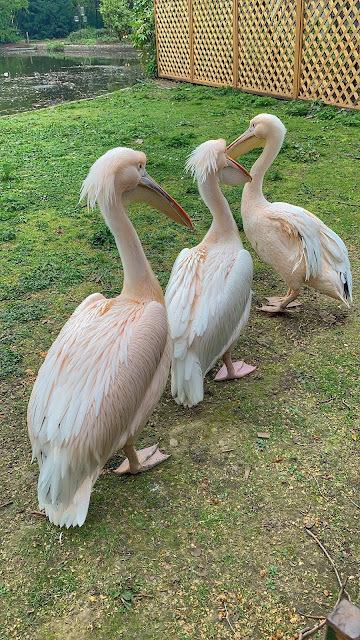 Mindful of building up an appetite for more food later in the day we strolled through St James's Park, admiring the pelicans as we passed through. Japan Centre on Panton Street is somewhere I always visit if I'm passing by. 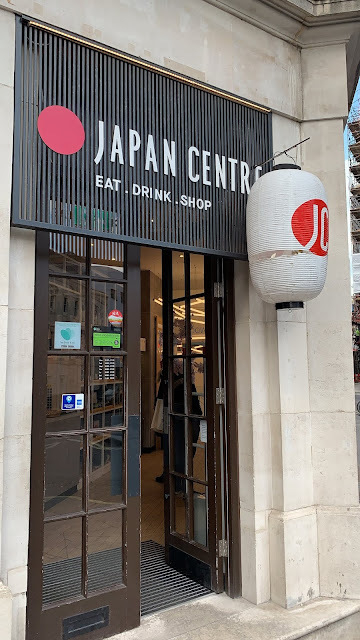 If you're looking for delicious bento boxes, Japanese snacks, saki or cookware then this is definitely somewhere you'll want to visit. I was still trying to build up an appetite for tonight but the tempura on display was calling my name! 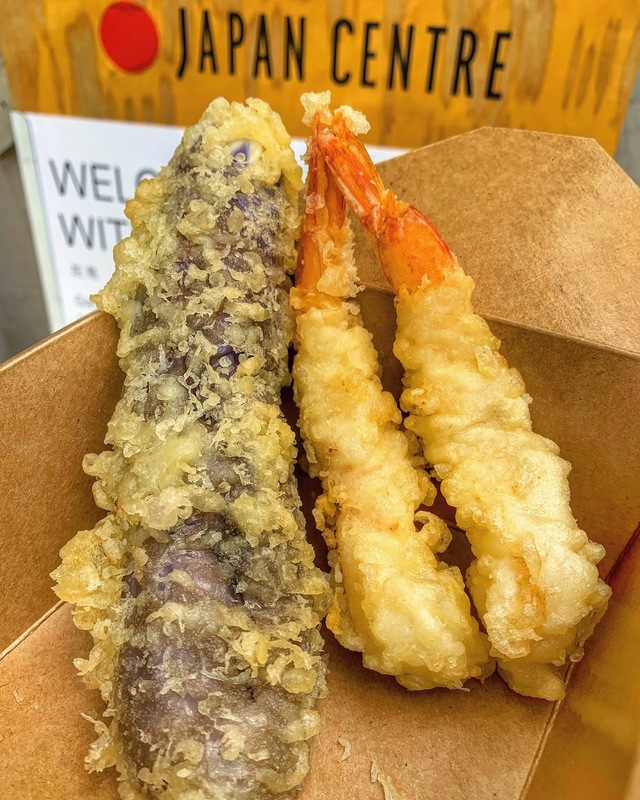 This tempura aubergine and prawn box cost less than £5, irresistible. 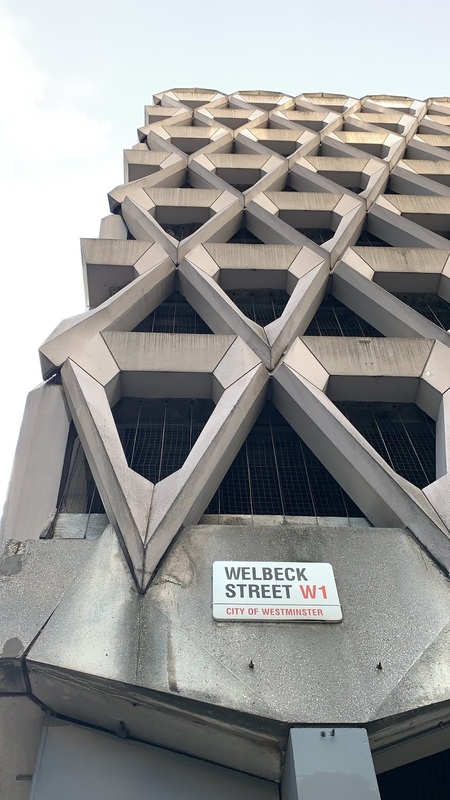 Just behind Debenhams on Oxford street you can find Welbeck Street car park. 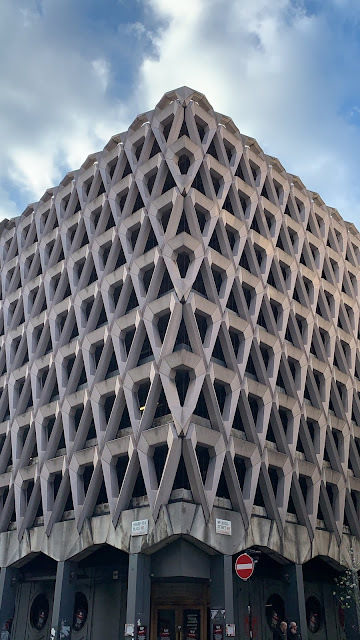 A stunning Brutalist masterpiece in my opinion, the geometric facade takes my breath away every time I see it. It was built in the 1970's and designed by Michael Blampied and Partners. 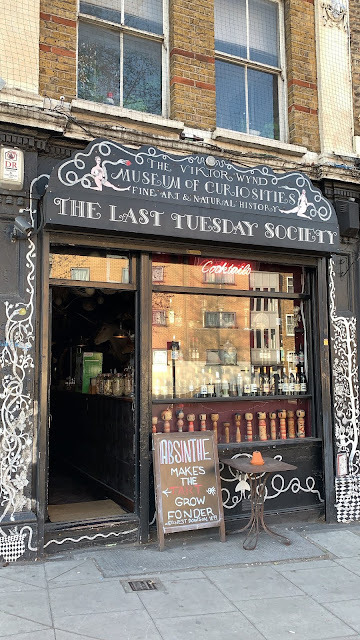 I'd come along to visit for one last time as it was soon to be destroyed having failed to be saved by Historic England. Despite it's striking design it didn't meet the listings required, in part due to Centrepoint having a similar geometric facade. A sad moment for this incredible structure which will eventually be replaced by something with far less impact on the eye. Our final stop for the day was Covent Garden where Shake Shack were putting on a party and we'd been invited! Six years had passed since the Covent Garden branch had first opened and it had just undergone a revamp and now also featured an outside terrace. 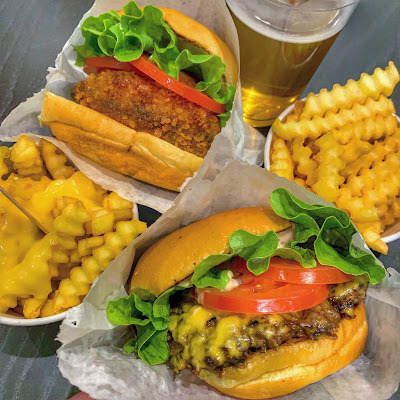 So an evening of burgers, fries, frozen custard, shakes, wine and beer. Also an excellent opportunity to meet other food bloggers and instagrammers I'd only up to now chatted to online. Following a restful day back in Norwich we were back on the train London bound again. Our first port of call was Southbank, easily walkable from Liverpool Street. 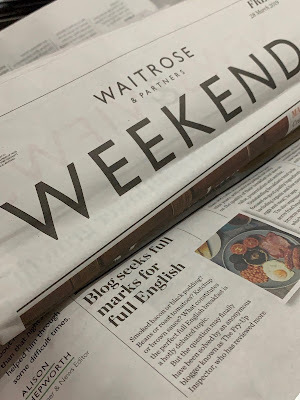 As we crossed London Bridge I spotted a copy of Waitrose Weekend left on a wall. I'd been looking forward to getting a copy of this, as on page two I was featured in an article regarding my blog. The Weather today was much better, it was quite mild and the sun was shining. 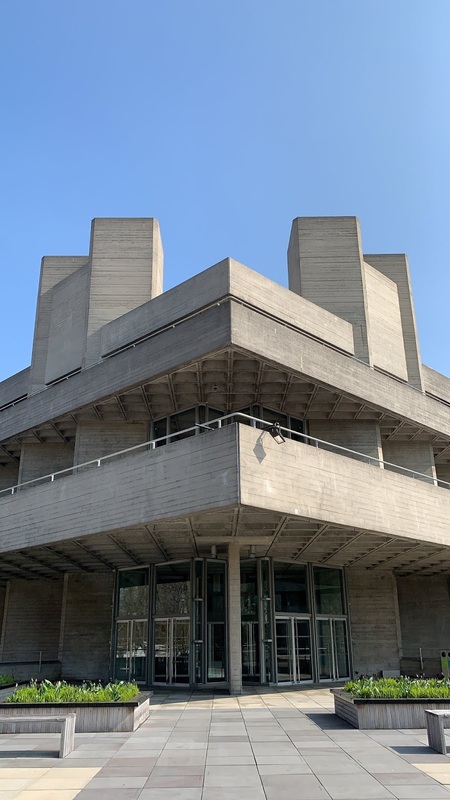 The Southbank is home to my favourite building on the planet, the brutalist eye candy that is National Theatre. 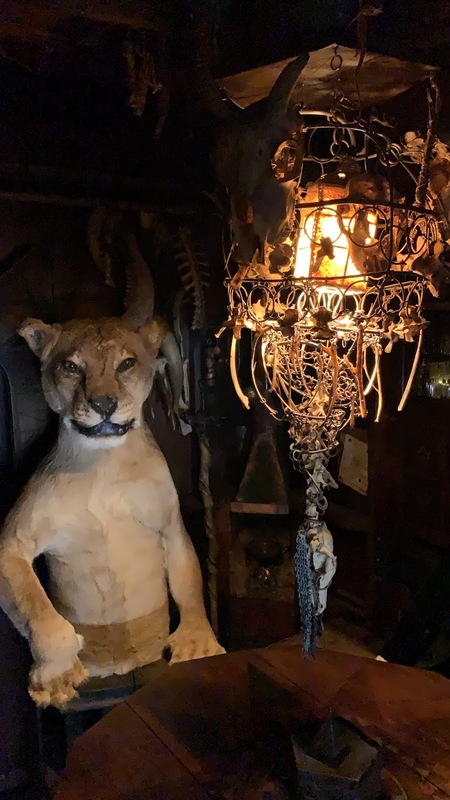 Not everyone shares my passion though, Prince Charles once described it as "a clever way of building a nuclear power station in the middle of London without anyone objecting". 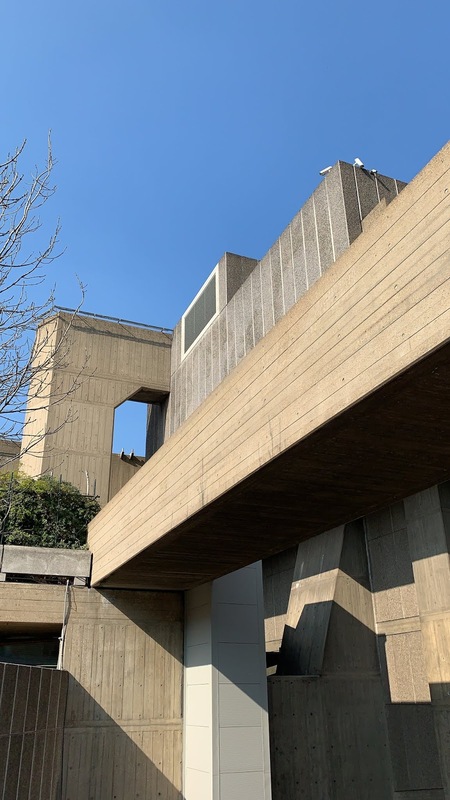 A few minutes walk along the South Bank and I found myself admiring another Brutalist masterpiece, Queen Elizabeth Hall. 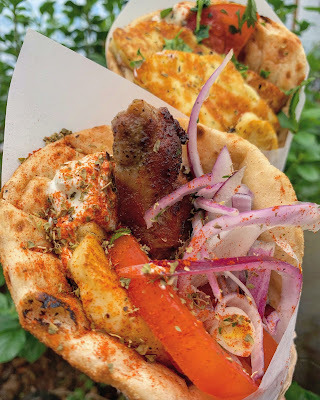 All this concrete was making me hungry so time to visit Southbank Centre Food Market. I'd been keen to visit Street Pig since passing them on Broadway Market late last year. 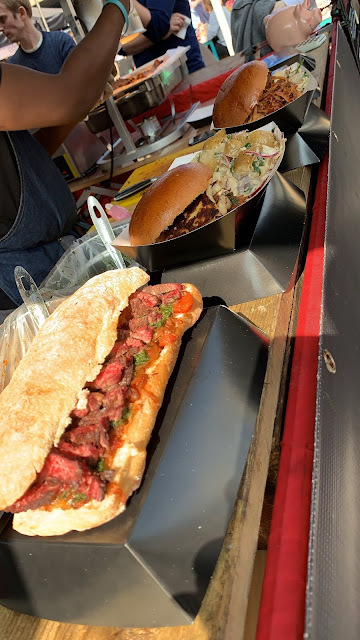 You can find them serving Ribs, steak, brisket, pulled pork and halloumi at various street food markets across London. Choosing what to try here was no easy decision as everything looked incredible! 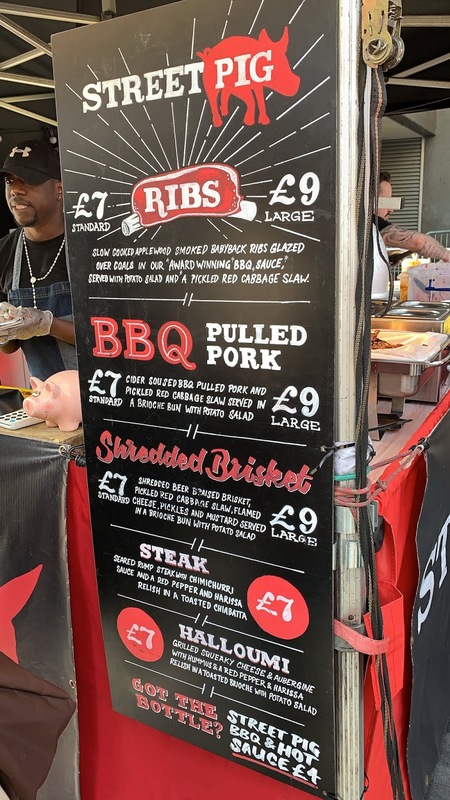 Eventually I opted for a stack of slow cooked pork ribs covered in BBQ sauce. 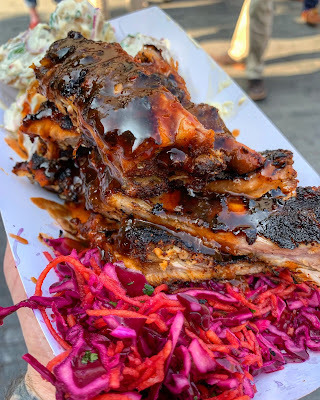 The applewood smoked meat falls off the bone and their homemade sauces are excellent, they're served with a delicious potato salad and pickled red cabbage slaw. 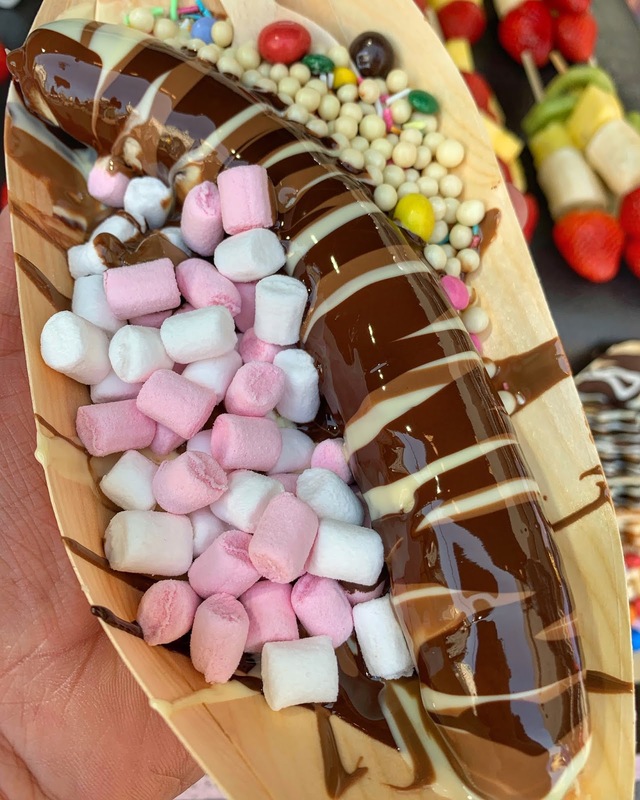 Every time I've passed through South Bank Centre Food Market I've paused at the Chocofruit stall to admire their work. Usually I'm far too full up to eat anything else and today was no exception. I just had to try something though so ordered a chocolate covered banana with a selection of toppings. Watching them zig zag the dark, milk and white melted Belgian chocolate over the fruit is quite mesmerising. I was very pleasantly surprised by the price too, just £4! Whilst I was stuffing my face with ribs and chocolate covered fruit my wife had been searching for her lunch. She returned with a beautifully presented vegan mixed platter from Ethiopiques. 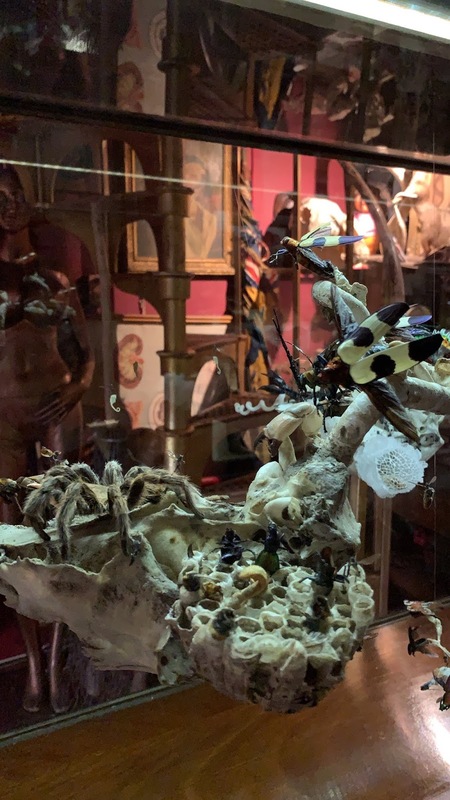 Next we headed to Bethnal Green to visit The Viktor Wynd Museum of Curiosities. Upstairs is a bar but if you pay £6 you can make your way down the spiral staircase into the museum. There's lots of curious things to look at down here so it's well worth a visit. You can even enjoy a beer down in the museum whilst sitting next to one of it's many inhabitants! Our final stop of the day was Canopy Market in Kings Cross. 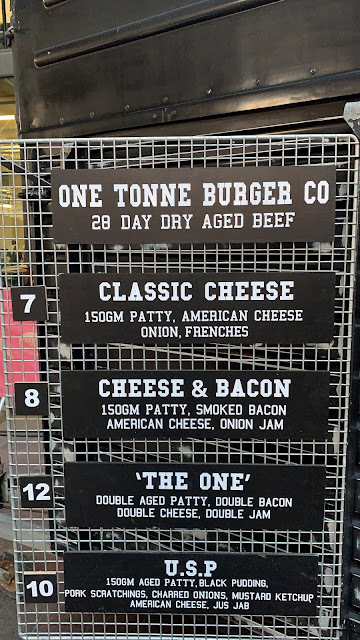 I'd been waiting to try a burger by One Tonne Burger Co for months and we just happened to be in London on the right day. 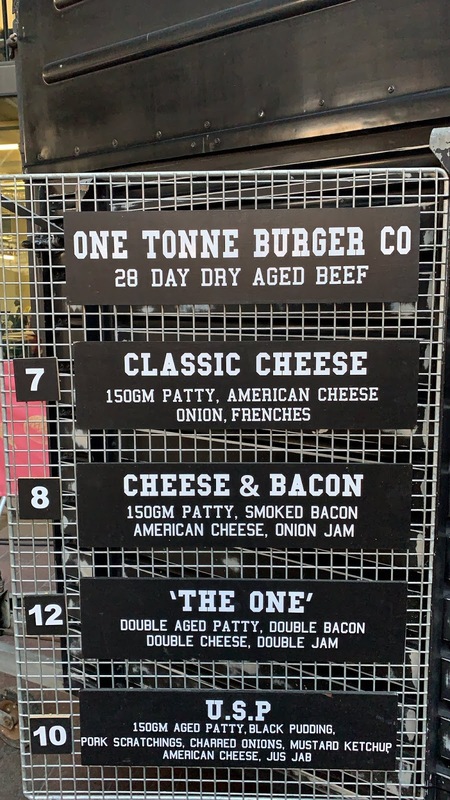 One Tonne are based in Portsmouth so they can be difficult to track down in London. 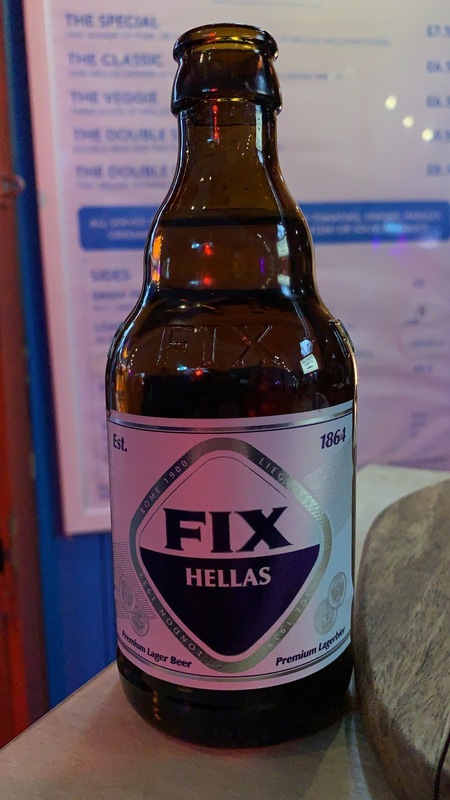 I was torn between ordering "The One" and the USP, I eventually opted for "The One". This really was 'The One' when it comes to burgers! Two 28 day dry aged beef patties with smoked bacon, American cheese and onion jam. Hands down the best burger I've ever eaten, just incredible! 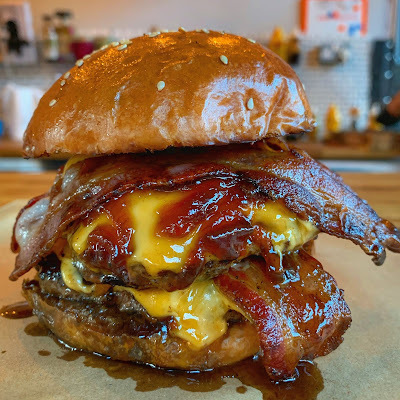 I chatted with James whilst he prepared it in front of me, watching him hand press the patties, timing everything perfectly and putting it all together was fascinating to watch. I just hope that this style of burger eventually makes it to the streets of Norwich one day. 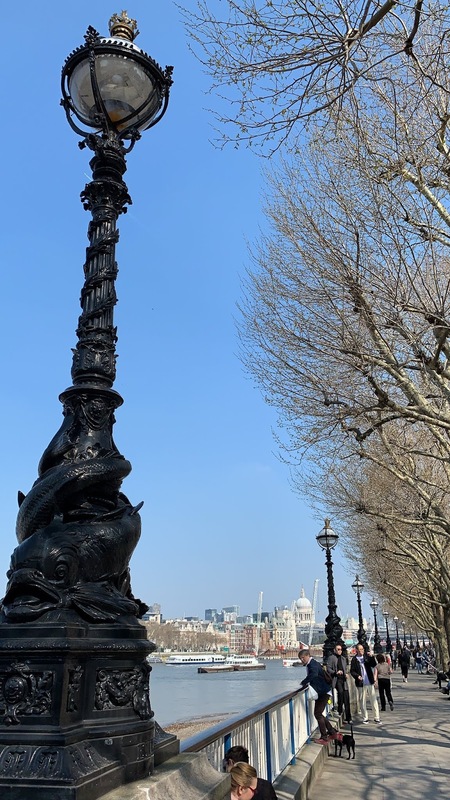 An incredible end to our time in London, I can't wait to get back there again in May.